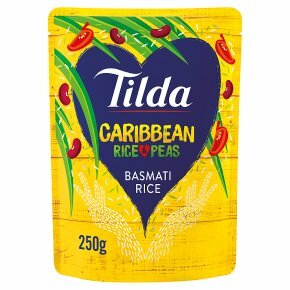 An authentic Caribbean Rice & Peas recipe combining rich coconut, hearty beans (not peas!) and a flavoursome chilli kick! Ready in 2 mins. Gluten free. Free from artificial colours, flavours and preservatives. Suitable for vegetarians & vegans. Delicious served with jerk chicken or as a vegetarian curry. Simply sauté a handful of chopped tomatoes, cubed sweet potato and a dash of pepper sauce. Once cooked add the rice. Squeeze pouch, tear strip, microwave 800W 2mins.Microwave ovens may vary. Adjust cooking time accordingly.